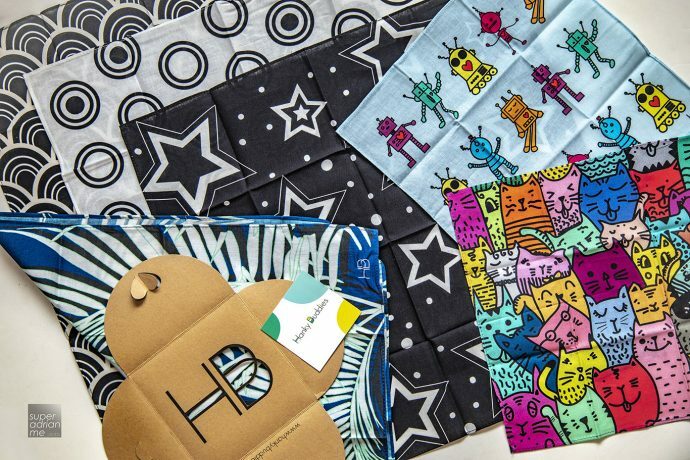 Hanky Buddies is an eco project amongst three friends from marketing communications and creative design backgrounds to reduce tissue paper and plastic waste. 27 billon kilograms of tissue paper would have been consumed by 2021. I have been using hankies since I was a kid. So when I wanted to get new ones for the new year, I stumbled onto an Instastory that featured Hanky Buddies. The designs are loud and colourful and they match my collection of socks from Freshly Pressed socks. Hanky Buddies’ collections fall into three categories. Fancy MONOCHROME patterns in black and white. POP features more fanciful coloured patterns such as tomatoes, leaves or bananas. JUNIOR BUDDIES are cute and perfect for kids and the young at heart. I got myself Mount Fuji, Beam Me Up Spotty, Stars and Beyond, and Tropicana at S$12.95 each. And One-eyed Cat and Mr Roboto at S$9.95 each. Enjoy free shipping when you shop over S$40 at hankybuddies.com.